The Oscar Meyer Weinermobile is so popular that it’s got its own fan club, but where’s the love for the other bizarre food-shaped vehicles? 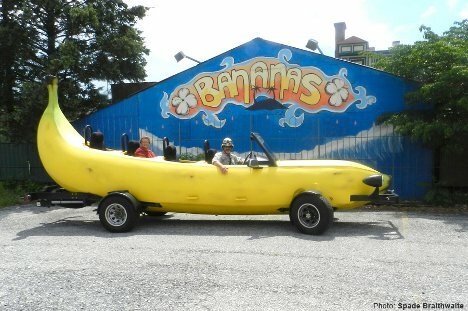 A brother/brother duo transformed parts of an old pickup truck into a fantastically ridiculous car called, quite appropriately, the Big Banana Car. According to Steve Braithwaite, the builder of the fruity yellow behemoth, inspiration for the car came from a fruit bowl in a gas station. With a little help from some co-conspirators, Steve and his brother transformed an old 1993 Ford F-150 into a rolling four-seat banana. 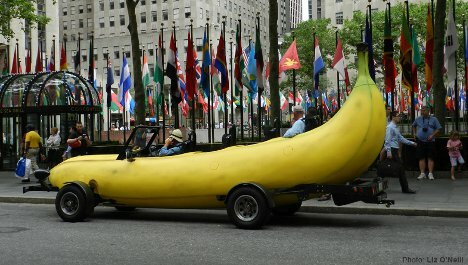 Braithwaite & Co. plan to drive the Big Banana Car all around the world, although they haven’t yet settled on a starting point for the journey. 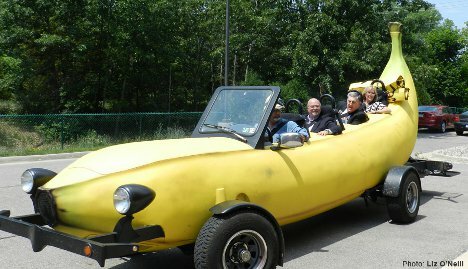 One thing is for sure: wherever it goes, the Big Banana Car is sure to draw amused stares. See more in Art Vehicles or under Transportation. December, 2012.